Early 1980s Czechoslovakia – at the start of a new school term at a suburban high school, a seemingly empathetic and kind new teacher, middle-aged Marta Drazechova arrives. Based on a true story of a Communist school teacher who manipulated her pupils and their families for unprecedented personal gain. 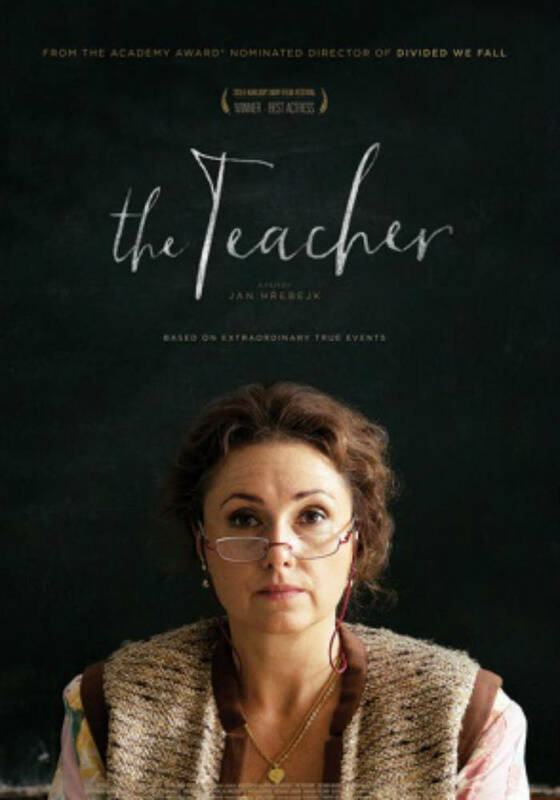 The prolific Czech director-writer duo Jan Hrebejk and Petr Jarchovsky (Divided We Fall) return to top form with the compelling Slovak-language dramedy The Teacher. Set in Bratislava during the final decade of communism, it examines the abuse of power at a middle school. Zuzana Maurery (named best actress at Karlovy Vary) tears into the part of a lifetime as a terrifying instructor who heads the local Communist party and uses her pupils to manipulate their parents for her own personal benefit. Each fall, middle-aged Comrade Drazdechova (Maurery) greets her new class of “tweens” by asking them to introduce themselves and share what their parents do for a living. She explains that she is a widow of a high-ranking military officer and that it’s good to know how the parents might help the class. Viewers are quickly clued in to what is going on when one boy replies that his father is a taxi driver and, “If you need a lift, no problem.” Sure enough, Drazdechova spends her evenings on the phone, asking this parent to pick up groceries and that one to stop by and fix her lamp. When she receives a complimentary perm from a hairdresser, we witness the quid pro quo: She tells the parent to advise the child to learn specific lessons before a test. But not every parent is willing or able to satisfy Drazdechova’s demands. Marek Kucera (Csongor Kassai) works as an accountant at the airport. When the teacher asks if he could facilitate the illicit transport of a cake to the Soviet Union for her sister’s birthday, he is unwilling to risk his job. “What is this communist pig thinking?” he fumes to his wife. “I don’t have any contact with the flight crews.” But Drazdechova does not like to be crossed. She takes out her displeasure on the Kucera’s young gymnast daughter Danka (Tamara Fischer). Drazdechova also has it in for Filip Binder (Oliver Oswald), a talented wrestler with a crush on Danka. At first, the brutish Mr. Binder (Martin Havelka) doesn’t understand what is going on and savagely punishes his son for missing practice, unaware that Drazdechova more or less forces kids to go to her house after school to clean and run errands. But even though Mr. Binder has a reputation as a drunk and a troublemaker, he has principles and refuses to be blackmailed into providing free work for the teacher. At the parents’ meeting, the Kuceras and the Binders sign a document drawn up by the head teacher to discipline Drazdechova. But the other parents who have improved their kids’ grades through their brown-nosing, scoff and deride their complaint. Hrebejk and Jarchovsky ratchet up the dramatic tension over whether or not others will sign, in particular Mr. Littmann (Peter Bebjak). The handsome Littmann, once a respected professor of astrophysics, was demoted to manual labour after his even more brilliant wife left the country. Drazdechova takes a shine to Littmann and arranges for him to be the school’s caretaker, all the while none-too-subtly pressuring him to take a romantic interest in her. Although dealing with weighty matters, Jarchovsky’s script (which is based on a real-life incident he experienced during primary school) is leavened with welcome humour and irony and the film’s coda is delicious. As usual, Hrebejk’s direction is smooth and the ensemble performances top-notch. While his Czech pictures are normally shot in widescreen, the visuals here are sized for television, although this suits a story made up primarily of interiors. Production designer Juraj Fabry provides visual interest with an assortment of wacky period wallpaper and wood panelling. Source: variety.com/2016/film/reviews/the-teacher-review-ucitelka-1201811487 Alissa Simon : Edited extracts /accessed 23/10/17.